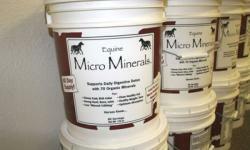 70 minerals plus Digestive Detox that every jumping or performance horse needs to train and compete. Next Day Jumps endorses this mineral supplement to any rider that uses their horse in any jumping activity. This balanced, non toxic mineral supplement will supply your horse with the needed minerals to replenish those used in performance. 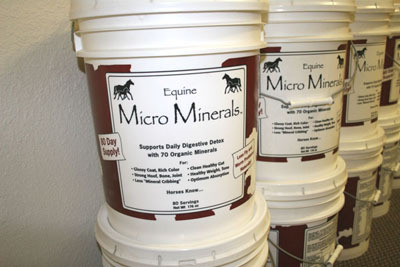 Every horse need Micro Minerals and the gentle Digestive Detox. Allow your horse to thrive under stressful conditions by Removing toxin buildup, Improve adsorption, reduce allergies, protect against internal parasites, eliminate waste of parasites, less odor in manure, reduce fly larvae in manure. This is a human food grade supplement. No chemicals, no preservatives, no fillers, no herbicides or pesticides, no GMO. This is a 5 gal pail - A 80 DAY SUPPLY. Made in USA.